Nicaragua’s nickname, “The Land of Lakes and Volcanoes,” is a good description of this beautiful Central American nation. The actual name of Nicaragua is believed to stem from Nicarao, the name of the people who inhabited the area on the shores of Lake Cocibolca, (now called Lake Nicaragua) when the Spanish conquest first arrived. This name, Nicarao, combined with the Spanish name for water, agua, is how the country got its name. The country has two land neighbors; Honduras to the north and Costa Rica to the south. Its eastern border lies along the Caribbean Sea and its western border along the Pacific Ocean. Lago de’ Nicaragua or Lake Nicaragua is located in the southwestern area of the country. Aside from this massive lake there is another large lake called Lake Managua. Additionally, the area has over 400 volcanoes. Nicaraguans use steam from their many volcanoes as geothermal energy. They also are home to the “Dual Volcano.” It is the only volcano in the world that is fed by two different magma flows. The area also has many lagoons and rivers in the region. Additionally, there are small islands, called cays, located in the Caribbean Sea. The country is made up of three geographical regions: the pacific lowlands, in the west, the Caribbean lowlands, in the east (also known as the Mosquito Coast) and the central highlands, located between the two. When the Spanish arrived in the early 1500s, there were three main tribes residing in these areas, each, its own monarchy, headed by a chief. Many of these indigenous people later died from diseases the Spanish brought over, as well as from tribal wars. Today the population of Nicaragua is mostly mestizo, about 17 % white, 5% Amerindian and 9% black. The black population lives mostly on the east coast where the community primarily speaks English and Creole. For a time, from 1633 until 1860, the British controlled this area on the east coast. Managua, the most populous city and also the capital, is located on the southwestern shore of Lake Managua. The total population of Nicaragua is just over six million. The population is young and has one of the healthiest growth rates in the region. Most Nica’s, as they are called, live in urban areas. This is a good thing since they do not have addresses in Nicaragua. People get their mail based on their proximity to a known landmark. 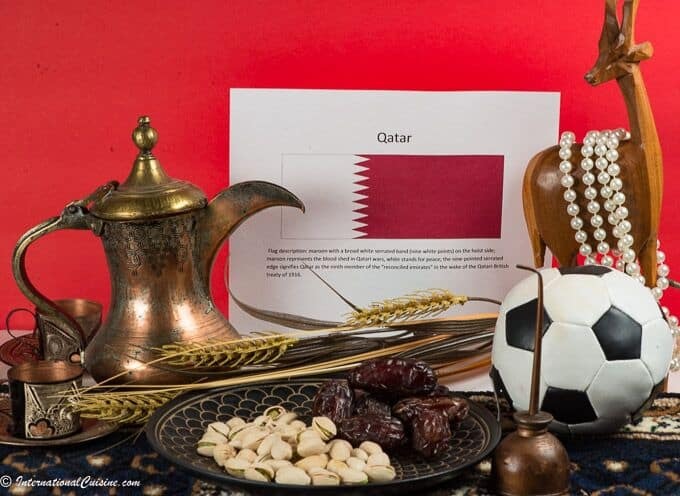 Spanish is the official language, although English, Creole and indigenous languages are also spoken. The literacy rate is 82 percent and education is compulsory for only six years. Nicaragua gained independence from Spain in September of 1821, however they then became part of the Mexican Empire. 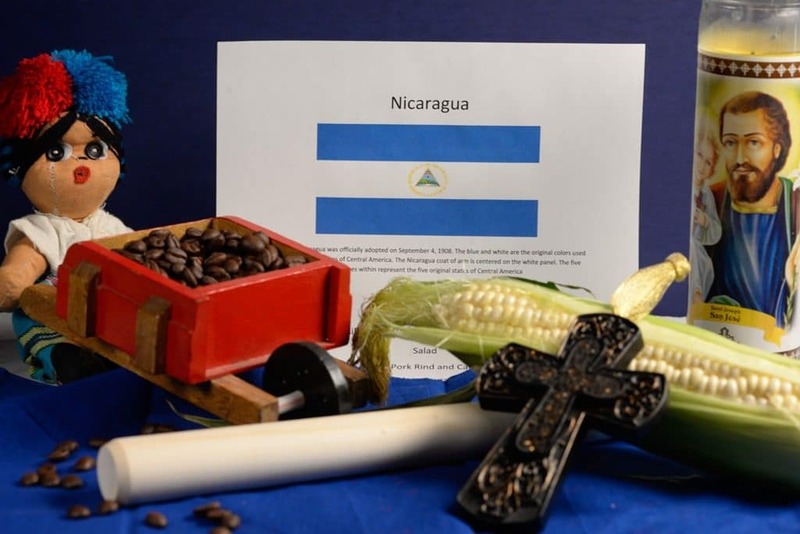 Eventually Nicaragua gained complete independence on April 30, 1838. Independence, however, brought years of conflict between the conservatives and liberals. There was even a brief time an American, named William Walker, decided to take control of the country and declared himself president/dictator, with the idea of annexing the region to the United States as a slave state. This occurred from 1856 to 1857. He was forced out a few years later. The Somoza regime was Nicaragua’s longest lasting hereditary, military, dictatorship and ruled there for 43 years. After a few other leaders, it was the Sandinistas who took charge, which eventually led to the counter, revolutionary forces (who were financed and trained by the U.S. CIA.) They were called the Contras, which led to the “Iran-Contra” scandal during President Reagan’s administration in the USA. The U.S. had concerns with the country’s ties to Cuba, Venezuela and Russia. Over the years, millions of dollars in aid were given to the government, especially after Hurricane Mitch in 1988, which was one of the worst hurricanes in their history. There has been massive corruption over the years, leaving nearly half of Nicaragua’s people living in poverty, on only $2 a day. Despite strong opposition from the U.S. and stifling embargos, Daniel Ortega (a known Sandinista), won reelection. Today, the country maintains relations with the U.S. and its rivals, such as Iran, and Venezuela. Despite apprehension concerning Ortega’s leadership, he has taken Nicaragua to new heights. Nicaragua was recently listed on the happiness index, as the top country on the rise for happiness in the last decade. The people in the county believe things are getting better. Tourism is an important piece of Nicaragua’s growing economy. Each year, for the past decade, it has grown some ten percent. Nicaragua’s west coast is known worldwide for its spectacular surfing beaches. Lake Nicaragua is also a huge tourist attraction. Kayaking through spectacular islets and hiking volcanoes are also tourist attractions. Coffee tours are trendy, as Nicaragua is a big exporter of coffee. Other exports include: beef, shrimp, lobster, tobacco, sugar, gold and peanuts and textiles and apparel are on the rise. Nicaragua is part of the CAFTA-DR, a free trade agreement that has been a major contributor to their growth. Nicaragua is filled with natural beauty and extremely, warm and hospitable people. The city of Granada was the first city to be settled by the Spanish and has some of the most well-preserved Spanish, colonial style architecture. Leon is another popular, city destination. It used to be the capital city, up until 1857, and is home to the National University. It is also home to the Ruins of Leon Viejo, dating back to the 16th century. This site is Nicaragua’s only UNESCO World Heritage site. Nicaragua is a laid back country and one that is among the safest to visit in the Central America. While it is replete with volcanoes, rainforests, mangrove forests, beautiful islands and spectacular beaches, it is, nonetheless, the friendly locals that will leave you with the fondest memories. As we look into the cuisine of Nicaragua, or “La Comida Nica” (as they call it), is a Latin creole mix of indigenous and Spanish dishes. Corn, rice, beans, plantains, yucca and pork are all common ingredients, as is seafood, along the coast. They have an extensive variety of tropical fruits, which they incorporate into their diet. Nacatamales are their national treasure. They fill their tamales with meat, vegetables, olives and prunes and wrap them in banana leaves. We set the scene with the colors of the Nicaraguan flag; blue and white. The blue represents the two coasts and the white symbolizes peace. We placed a Saint candle on the table, as nearly every village in Nicaragua has a named, village Saint and all the festivities to go along with it. We also included a cross, as most of the population is Roman Catholic. Also a baseball bat was added, since it is the national sport (even beating out soccer, another very popular sport there.) Also we included an ear of corn, as it is such an important staple ingredient. Many drinks are made from corn as well as their tamales and tortillas. Lastly we placed a banana leaf along with some coffee beans. 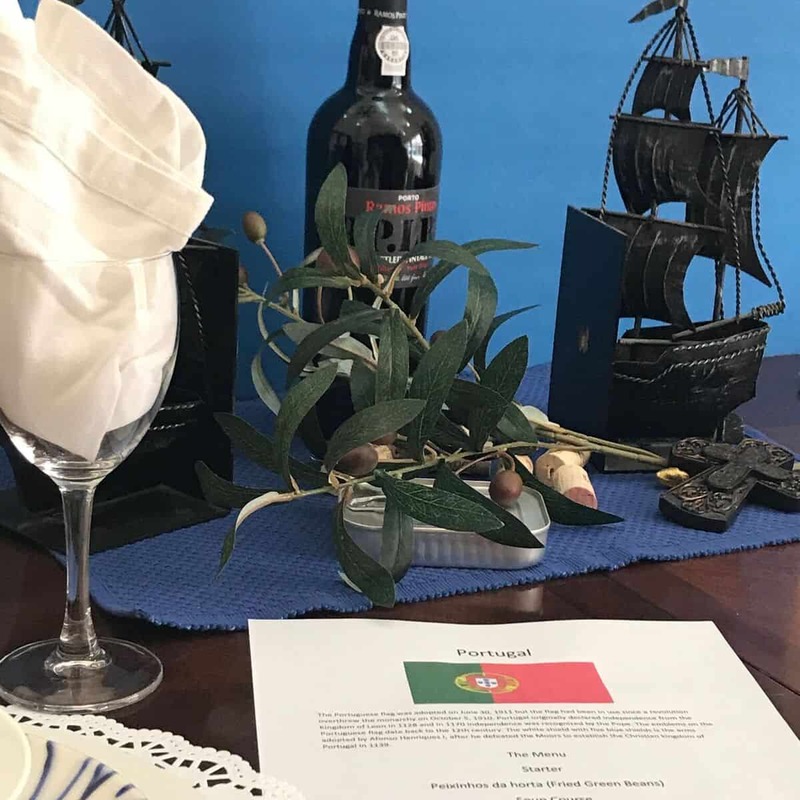 We began our meal with a toast, “Salud”, which means, “Cheers” in Spanish followed by, “Buen Provencho”, which means,”Bon Appetit.” The appetizer was called quesillo, which means “little cheese. “ The tortilla surrounded a soft, white cheese that goes by the same name. 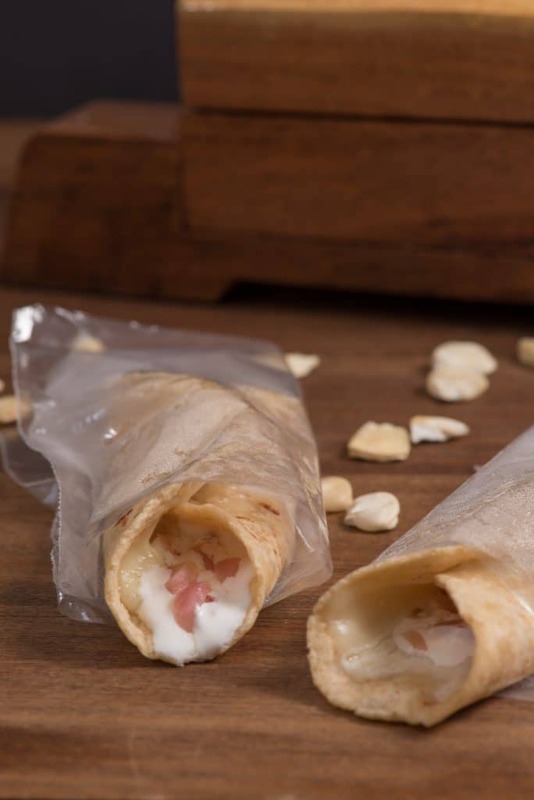 It is somewhat similar to mozzarella cheese and it is then topped with picked onions, and sour cream and vinegar. They are usually served at a roadside stands in a thin, plastic sleeve; warm cheese in a tortilla, simply magnifico! We then savored another very popular dish called Vigoron. It is believed that this dish was developed in Granada, Nicaragua by a woman who went by “La Loca” or “Crazy Woman.” She named the dish Vigoron, after seeing a poster advertising an early medicinal tonic, back in 1914. 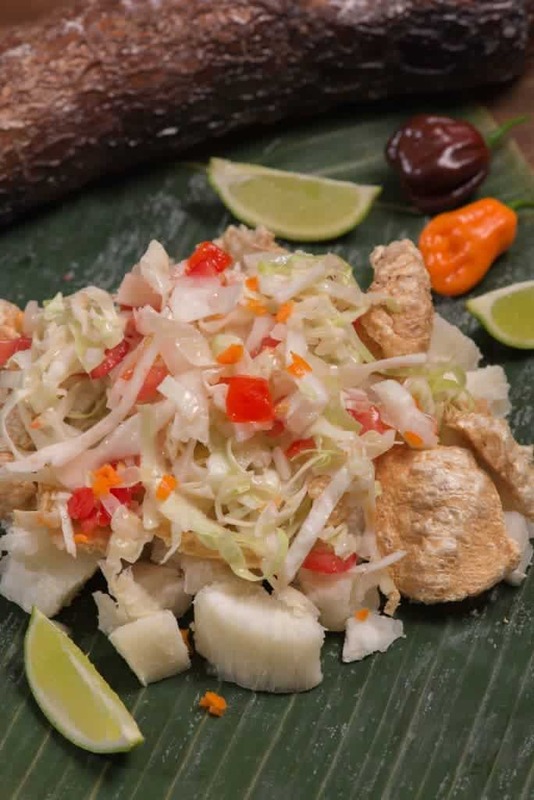 This dish consistis of a salad, known as curtido, that has cabbage, tomatoes, onion, chili pepper and lime, then boiled yuca root and fried pork belly or pork rinds are added. We loved it! For the main course we had the famous nacatamales. The masa is somewhat similar to a regular, mexican style, tamale masa however, they use a bitter orange in it. 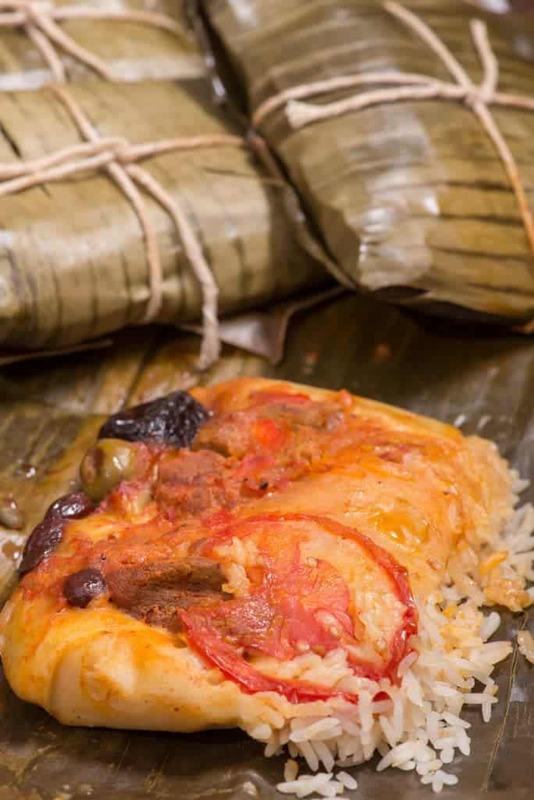 The filling is typically pork with rice, onion, pepper, potato, green olives and prunes. The meat is seasoned with anchiote. The biggest difference in this dish and a traditional tamale is that this tamale is wrapped in a banana leaf instead of a corn husk. This imparts a wonderful flavor to the tamale. The banana leaf is secured with twine and then the tamale is steamed to perfection. (You do not eat the banana leaf). This nacatamale was very filling but we managed to enjoy it with the gallo pinto; another staple dish of rice and beans mixed together. 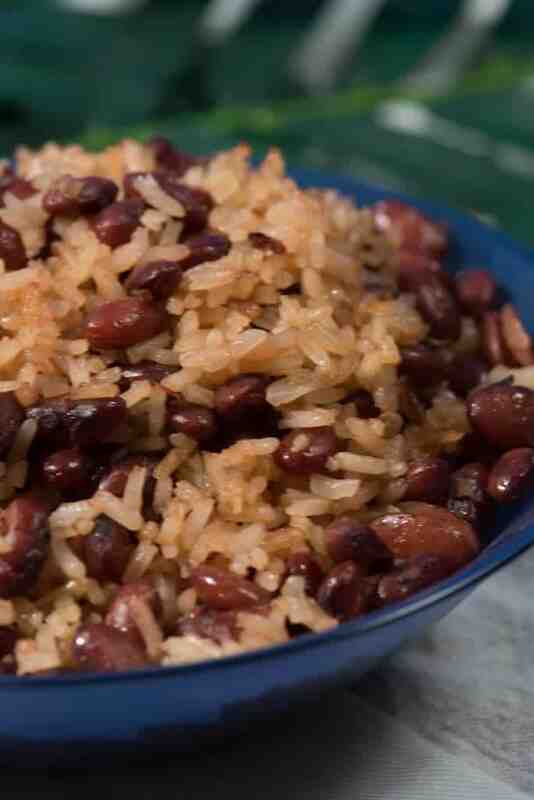 It is typically made with day old rice and small, red kidney beans. 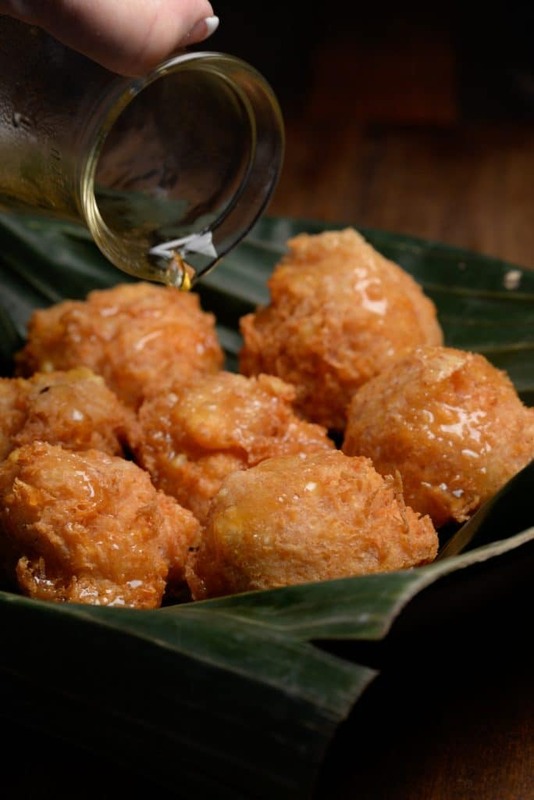 It is flavored with garlic, onion and chicken stock and fried together for a delicious side dish. Often in Nicaragua, gallo pinto would be a main dish, as opposed to a side, offering the balance of protein with carbohydrates, for an inexpensive, yet robust, meal. For dessert we took the hot and syrupy, cassava donuts, called Buneulos de yuca along with a nice, strong cup of coffee outside, into the night air. We wanted to see what constellations we could find. In Nicaragua, you can see 86 of the 88 constellations. It was a beautiful, clear summer night and a perfect ending to our Nicaraguan meal. I always look forward to your new “journeys” Our entire family enjoys trying the recipes and learning more about the cultures you share. Thanks so much for taking the time to create these posts. Thank you for your very kind comment. I am so happy that you are enjoying the journey too! You made my day! Your posts are always an education for me about a country,and I learn so much how the food is part of the history. Thanks for taking the time to write your informative posts. Thanks MLiss… I am so happy you are enjoying the journey!